Ukrainian Journal of Ecology is an Open Access, Quarterly, peer-Reviewed Journal. Formerly known as “Bìologìčnij vìsnik Melìtopolʹsʹkogo deržavnogo pedagogìčnogo universitetu ìmenì Bogdana Hmelʹnicʹkogo”, the print version of the journal has served the scientific community from 2011 to 2016. 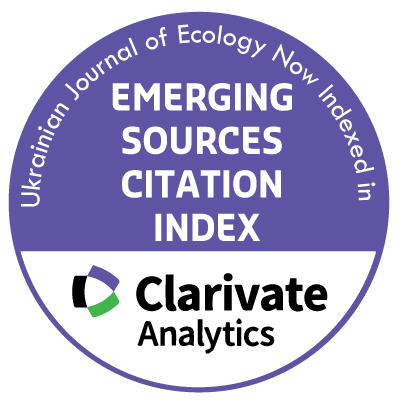 Since 2017 the digital form of the same is available as ‘Ukrainian Journal of Ecology’. Ukrainian Journal of Ecology publishes original scientific research work dealing with all aspects of ecology, with special regards to ornithology, entomology, ecology of population, community, and ecosystem. Without considering taxon, environmental and geographical limitations, the journal accepts empirical studies, case reports and qualitative research from a wide range of topics within these fields. Allows the dissemination of peer-reviewed manuscripts containing original research or scholarship immediately upon publication, without requiring registration or other restrictions to access. Requires copyright holders to allow users to “copy, use, distribute, transmit, and display the work publicly and to make and distribute derivative works, in any digital medium for any responsible purpose, subject to proper attribution of authorship”.